Slip, Trip, Stumble, Tumble - Keystone Elder Law P.C. Understanding fall risk is an important aspect of fall prevention. There are a number of assessment tools which can help identify potential risk. These tools consider various factors which can influence the likelihood of a fall and assign certain scores to each factor. The scores are then added together. Each tool has specific score ranges which indicate a low, moderate, or high risk of falls. The assessment tools ask about the use of certain types of medications and presence of health conditions (such as the ones mentioned in last week’s column), which may increase the likelihood of a fall. Cognition or one’s ability to think clearly and interpret environmental cues is a factor in some fall risk assessment tools. The use of an ambulation aid such as a walker or cane may be counted, as can a history of previous falls and one’s age. Bowel and bladder functioning may increase fall risk if an individual experiences feelings of urgency/incontinence and often hurries to reach the restroom in time. Tools used by hospitals to assess falls may include the presence of an IV as a risk factor. 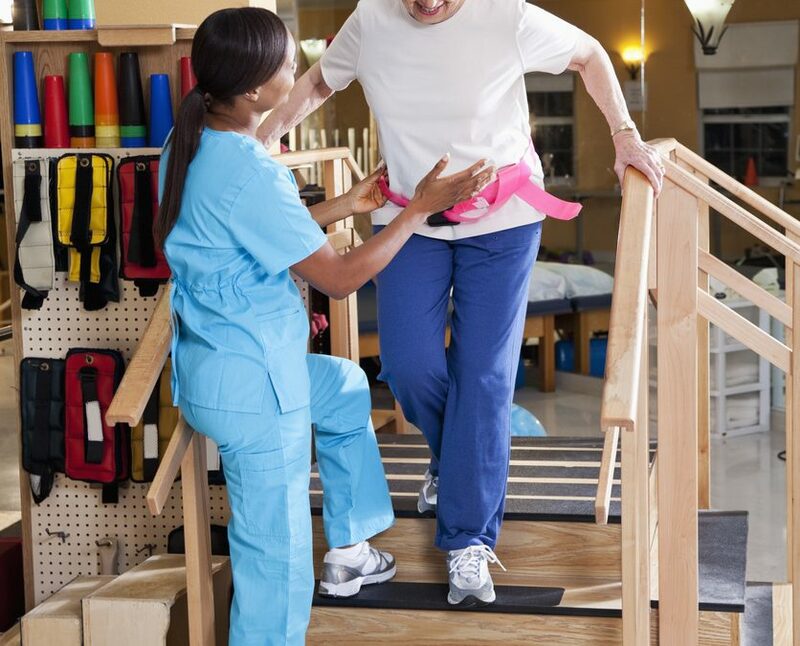 One simple assessment which can be used by both professionals and nonprofessionals to determine an individual’s safety with transfers and ambulation is called the TUG tool (Timed Up & Go). This test has been demonstrated to have a high level of sensitivity and reliability. In this assessment, when the observer says “Go”, the individual is asked to stand up from a chair, walk ten feet at a normal pace, turn around, walk back to the chair, and sit down. The observer records how long it takes for the individual to accomplish this process, and watches for difficulty rising from the chair (such as needing to push up with one’s arms), abnormalities in gait, shuffling or short steps, and unsteadiness or requiring more than three steps when turning around. The older adult should receive instructions and have an opportunity for a practice run before the process is timed. An older adult who takes longer than 14 seconds to complete this task is at risk for falling. Although an individual may blame difficulty standing or walking on weak leg muscles, these actions also involve joint movement and muscles in the abdomen and back, which work to provide stability, balance, and posture. Physical therapy can address strengthening, balance, coordination, range of motion, and flexibility, as well as endurance. A physical therapist will also evaluate safety concerns. One of the most common unsafe actions with walker use is holding onto the walker to help pull oneself up from a sitting to standing position. A walker is not designed for use in this manner and can easily tip over, taking its user with it. Instead, an individual should push up from the seat (hint: avoid chairs without arms, as it is more difficult to push up from the seat of a chair than the arms). Additional tips and techniques may be offered to make physical activity easier and safer. Outpatient therapy services are covered by Medicare, although there may be a copay. Some therapy centers offer a maintenance program for those individuals who wish to continue regular exercise using the therapy center’s equipment. Maintenance programs are private pay, but therapy will be a waste of time and effort if an individual returns to a sedentary lifestyle once therapy sessions are over. Participation in activities such as chair yoga or tai chi may also help preserve and even improve upon gains achieved with therapy.